For nearly 100 years members of the MRC rowed on the Milwaukee River above the North Avenue dam which, until the 1930's, was the city's principal recreational area with swimming beaches, swimming schools, and canoeing and rowing clubs. The Club is not Milwaukee's first or only rowing club. In the late 19th Century there was an earlier club called the Milwaukee Boat Club as well as other rowing clubs. The Milwaukee Rowing Club is fortunate to have an indoor training facility. The facility was nicknamed “The Barn” as a play on the true title of the building, the Barnabas Building. The Barn contains over forty Concept2 ergometers, a wide assortment of free weights, and other exercise equipment. This space is used primarily in the winter, but also is used when poor weather outside forces the team indoors. The Barn is located in the back of the Barnabas Building and our space can be accessed using the back of the building. 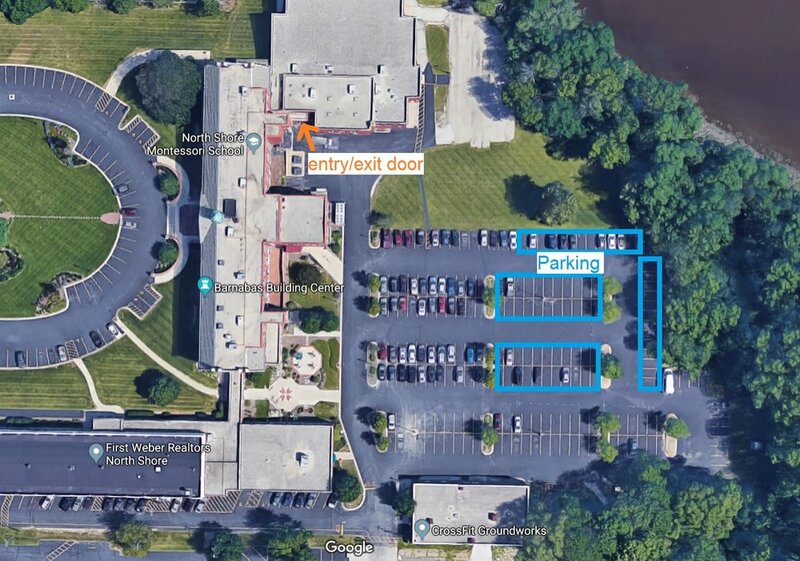 Put the following address in your GPS to be directed to the correct parking lot - 4630 N Estabrook Ln. See images below for reference on how to access our space. Upon entering the door, go up the staircase and through the door to the hall. You will access our space from the hallway. In the first image you will see an illustration of where our space is marked by a red arrow. You will want to follow the orange line to access the parking lot in the back of the building. If you end up in the front of the building you will be in the space marked by the dotted line. Parking is marked by the blue boxes and the entry door is marked with an orange arrow. Our space consists of the windows located to the right of the entry door/orange arrow.